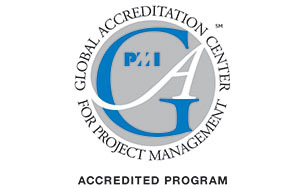 The online Master of Science in Project Management at St. Scholastica has been accredited by the Project Management Institute Global Accreditation Center for Project Management Education Programs (GAC). Degree programs that achieve GAC accreditation demonstrate and meet the GAC's rigorous global standards of accreditation, which include an assessment of each program's objectives and outcomes, faculty and student evaluations, onsite and online resources, annual self-evaluation, and proof of continuous improvements in the area of project management education. "Achieving accreditation with the GAC distinguishes our program," said Brandon Olson, Ph.D., associate professor of project management. "There are only 28 other GAC-accredited institutions in North America and 57 worldwide. Also, we are one of only 12 institutions across the world with this accreditation offering fully online master's programs." The skills and concepts taught in St. Scholastica's online Master of Science in Project Management program can be applied across a wide range of industries, and project management itself is a fast-growing, high-paying field. The 100 percent online program can be completed in two years. Olson said St. Scholastica's project management program stands out because its curriculum focuses on all three aspects of the Project Management Institute's "talent triangle:" Technical project management; strategic and business management; and leadership. "We cover all three areas. Being a liberal arts college, that's a natural fit," he said. He added that St. Scholastica offers specialization in strategic project management and leadership of global and distributed teams. All faculty members are experienced professionals and certified project managers. For more information, go to css.edu/pm.